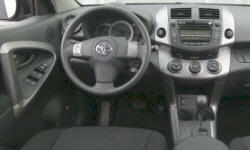 Why the 2007 Toyota RAV4? Plenty of visibility, no blind spots. Seat fits. Bottom long enough to support legs. Molded to body style. Not flat and short. Noticeably better feel to seat than any other vehicle. Cargo capacity is ok but purchased v6 and towing options for towing. Pulls 10 x 5 cargo trailer with little effort. MPG still 16+. Tried I4 and V6. Both very responsive. Purchased V6 for towing. Wife plans to buy 2nd Rav4 with I4 when lease up on current car. Have owned several Toyota vehicles in last 40+ years. Have always give great service. 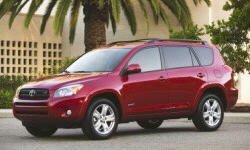 Why Not the 2007 Toyota RAV4? No NAV system available and audio is so so. First radio that came in had problems and had to be replaced under warrenty. Dealers here in Michigan want to sell you whats on the lot. Not much willingness to find the vehicle you want. If you want to order vehicle, no help. I had to do my own research and find the vehicle I wanted, tell the dealer who reluctantly got it.